Keep your baby looking stylish in this adorable cotton dog dress by Hello Doggie that features a gli.. Fabulously stylish for the four-legged fashionista! Constructed of soft, lightweight brushed cotton,..
Keep your baby in the holiday spirit with our adorable Holiday Sparkle dress. This dress by Hello Do..
Have your pup strut her stuff in her very own little angel dress.This dress by Hello Doggie is 100% .. This glamorous head turning dress will have your baby feeling like a super star. This dress by Hello..
What better way to show the Halloween "Spirit" than with this Ms. Boo Dress by Hello Doggie. Stay st.. 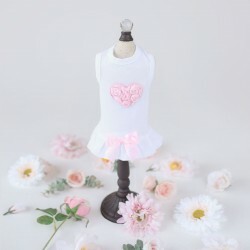 Style your fur baby in our snuggle soft Pearl Heart Baby Dress by Hello Doggie. T-shirt dress is mad..
Let your pup spread the love in Hello Doggies "Puff Heart Dress". Made out of 100% cotton, accented ..